invisible birds is very proud to announce the release of lind, raud, aastaajad, a 2 cd set of estonian recordings from three masters : yannick dauby, john grzinich, and murmer. 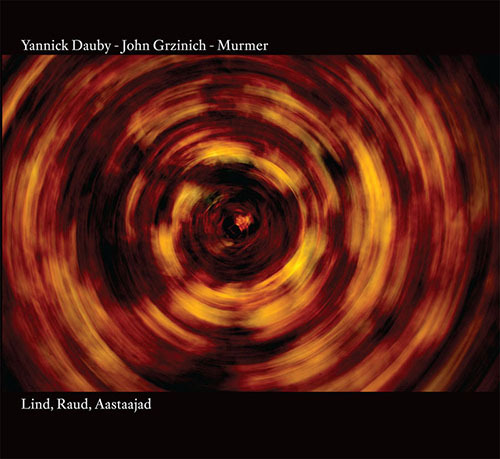 disc 1 – dauby : lind, raud – songs of birds and metal, recorded in Estonia in 2007.
disc 2 – dauby, grzinich & murmer : aastaajad – field recordings by john grzinich and murmer, electronic sounds by yannick dauby. two tracks composed by grzinich, two by murmer. yannick dauby mentions in his notes that, while in estonia, john grzinich guided him through some of his most favorite recording locations. it is in these locations where he feels the artist “becomes an instrument for the landscape”. the lind, raud, aastaajad recordings perfectly evoke the connection these three artists have to the landscape. in specified locations and seasons, they compose rich sounds from birds, metal, rain, snow, footsteps, melodious wind, water trickles, and more. the recordings subtly ensconce the listener in a sublime and poetic “view” of the landscape transforming itself. if anything, the estonian countryside is quiet. the clockwork schedule of the network of rural buses and the cackle of a black swan racing high above the trees is about all that you’ll hear. i (jim) had the pleasure of experiencing this estonian quietude a few years back, and i have to say that yannick dauby’s collection of field recordings is way more active than any i actually encountered. estonia is known for its avian diversity, although when i was there during the brief transition from summer into winter (literally, three weeks! ), the birds had all flown south… so dauby must have been there in later spring or summertime as he does capture a number of chittering sounds from those birds passing through from russia and finland to southern europe and north africa (or vice versa). between these avian recordings, dauby documents another common denizen of the estonian countryside – the giant chunks of metal dumped un- ceremoniously by the soviet agricultural industry. even without much wind, these abandoned grain silos and oil tanks resonate with thick rumblings and subtle overtones, which dauby dutifully records with contact microphones. these thrumming drones recall the alan lamb wire recordings as much as they do thomas köner’s deep gong recordings. disc one of this two disc set features dauby’s “songs for birds and metal” while the second features reworkings of dauby’s source material by john grzinich and murmer (aka patrick mcgingley), both of whom have exceptional catalogues of electro- organic compositions based often on phonography. grzinich’s two lengthy pieces are quieter and more subtle, focusing on the patter of dripping water and melting ice with flickering drones and harmonics forming arctic halos around those aquatic textures. the two murmer tracks intensify things comparatively against grzinich’s lowercase work, with thick drones amassed around what sounds like somebody trekking through the deep snow. those coleclough / köner drones manifest ominous black clouds and unsettled vibes, not heard elsewhere on the album and turning that estonian quiet into something haunting. all in all, a magnificent piece of manipulated field recording and sound ecology. following last weeks yannick dauby, here is more from him. before moving to taipei, he was in estonia for a while, which made him friends with john grzinich and patrick mcginley, also known as murmer. if i understand this double CD right, then one side as field recordings by dauby, mostly consisting of birds and metal, while the second CD has two pieces each by grzinich and mcginely using their own field recordings and electronic sounds by dauby. what exactly was the reason to combine this, otherwise then the omni-presence of dauby, i am not sure. the first CD is quite nice, if not a bit long for it lasts just over an hour. throughout the pieces which just have birds sounds are bit shorter and the metal pieces are (considerable) longer. don’t except some neubauten like banging, but rather rusty objects floating neatly in the wind, calm and peaceful. nice but, as said, there is overlap in this sound material. so the second CD might be a rework of the sound material from dauby, but perhaps also a mixture of their own sounds, along with electronic sounds delivered by dauby. perhaps if we look at this from a purely musical perspective this is the more interesting of the two CDs, unless of course you look for pure field recordings. the first CD is more like a great exercise in recording environmental sounds whereas on the second these pure field recordings are embedded in electronics, usually of a more lenghty and sustaining kind. of the two composers i think i preferred the two compositions by grzinich. murmer’s pieces are more simple, like layering various sound events together (water, walking, drones), but seem to miss out a bit on that added value. grzinich’s pieces have exactly that value, while it seems he either adds a fine amount of processing to the field recordings, or simply uses more layers of similar sounds to get more out of it. but throughout, overall, i think this whole package is one that is very nice. there is lots of explore here and no doubt even useful stuff for djs of a more experimental nature (pun intended). while perhaps still regarded by the masses as strictly for the movies, field recording, or phonography – the practice of using microphones to record an environment outside of the usual studio and concert settings – has come a long way in breaking predictable ties to the film industry, while also distancing itself from the back alley ethno-music documentation that also tends to fall under the same identifier. this gaining autonomy, as i see it, is a result of a multi-faceted propulsion of artists and independent organizations bringing field recording to the fore. there’s the field reporter blog, that advocates for the emotional potency of phonographic work through detailed reviews and historical insight. radio shows such as framework, on resonance 104.4fm out of london, focus on field recording and its use in composition, inviting the world to open their ears and listen. finally, artists like chris watson, whose close work with the BBC, has without a doubt done much in putting phonography on the map. while chris watson’s name has somewhat become synonymous with contemporary field recording practice, the three artists featured on lind, raud, astaajad – yannick dauby, john grzinich, and patrick mcginley (a.k.a. murmer) – have certainly proven their own adeptness at capturing sounds from environments that span the globe. the first of this two-disc set is a collection of recordings from estonia by dauby, capturing the sounds of birds and metal. by dauby’s accounts, and those of john grzinich – who accompanied dauby through the countryside – estonia is a largely quiet and empty place; dauby even describes it as a “wide open mental space,” attesting to the difficulties a sound hunter is likely to encounter there. despite this, dauby presents over an hour’s worth of recordings that more or less alternate between bird songs and contact microphone recordings of metal structures being activated by wind. cleverly, the bird recordings rarely breach three minutes in length, so as to not exhaust their brilliance, and to act as melodic counterparts to the much longer metallic drones. the second disc of this set presents two tracks each by murmer and grzinich, featuring electronic sound accompaniment by dauby. while dauby’s stand-alone recordings on the first disc were representationally honest – in the sense that they were very true to the sounds one might actually hear if placed in such an environment – disc two’s focus is on the use of field recording in a processed composition, reinterpreting dauby’s “snapshot” take on the form. the compositions aren’t rendered beyond interpretation of the source material, though. sounds like flowing water, buzzing flies, footsteps in snow, and birds are clearly heard amid the lush drone, which acts as the pulse to these pieces. dauby’s presence here is understated until the closing moments of “kevad,” where amassing electronic overtones crescendo into one of the finer moments of the album. there isn’t any new field recording ground being broken on lind, raud, aastaajad. but the disc showcases what these three artists strive for in their music – a liveliness that can exist in even the most quiet, and desolate of places. talked into by patrick mcginley (murmer) and personally guided by john grzinich. needless to say things are rather starting auspiciously.